2018 is a wrap and today, we bring you the December 2018 Metro Vancouver Housing Market Report. Overall, Metro Vancouver home sales last year were the lowest annual total in the region since 2000. The Real Estate Board of Greater Vancouver (REBGV) reports that sales of detached, attached and apartment properties reached 24,619 on MLS® in 2018 which is 31.6% decrease from 2017 and a 38.4% decrease from 2016. The sales total in 2018 was 25% below the region's 10-year sales average. Below is an infographic put out by the REBGV highlighting some key elements. The MLS® HPI composite benchmark price for all residential homes in Metro Vancouver ends the year at $1,032,400. This is a 2.7% decrease compared to December 2017. Looking at residential home sales in the Greater Vancouver region, there was a 46.8% decrease in comparison to December 2017 from 2,016 sales to 1,072. This is 43.3% below the 10-year December sales average. For a detailed look at the December 2018 statistics package, click here. For all your real estate needs, contact our office at info@wesellvancouver.ca or alternatively, at 604-716-6155. Below you will find a snapshot of June and July 2018 figures in contrast to the same month last year broken down by detached properties, condos and townhomes. For a more detailed look at the July 2018 Metro Vancouver report, click here. For all your real estate needs, contact our offices at 604-801-6654 or alternatively at info@wesellvancouver.ca. Based on projections for the remainder of the year, MLS® residential sales are expected to decline 9% to 94,200 units compared to 103,700 units in 2017. As well, 2019 and 2020 forecasts predict sales to decrease to 94,000 and 84,800 units, respectively. The Lower Mainland - Southwest region of the province (which includes the Greater Vancouver Area, the Fraser Valley and Chilliwack) constitutes ~60% of the housing demand in BC. Housing demand fell sharply in the first four months of 2018 as a result of tighter mortgage qualifications. There was minimal impact on home prices as a result of the slower housing demand. The type of housing market varies depending on housing type. The detached market in Vancouver and the Fraser Valley is showing a balanced market whereas the attached and apartment markets remain significantly undersupplied. While the housing market is slowing in growth, it is still continuing to be supported by a strong economy. Looking at the health of BC's economy has been promising. The economy has expanded at an above-trend growth rate for four consecutive years resulting in increased interprovincial migration, employment growth and overall strong consumer confidence. Early 2018 data has been consistent with the interpretation that the "BC economy will continue to produce the remarkable economic and employment growth enjoyed since 2014". Currently, there are over 60,000 residential units under construction in BC. The increase in new home completions coupled with the slowing housing demand will result in trending most BC markets towards balanced conditions this year, and lead to less upward pressure on home prices. For a more detailed look at the housing and economic forecast, click here. For all your real estate needs, contact our offices at 604-801-6654 or alternatively at info@wesellvancouver.ca. The announcement of Canada's first National Housing Strategy was announced by Justin Trudeau on November 22, 2017, which promises $40 billion of investment in affordable homes. 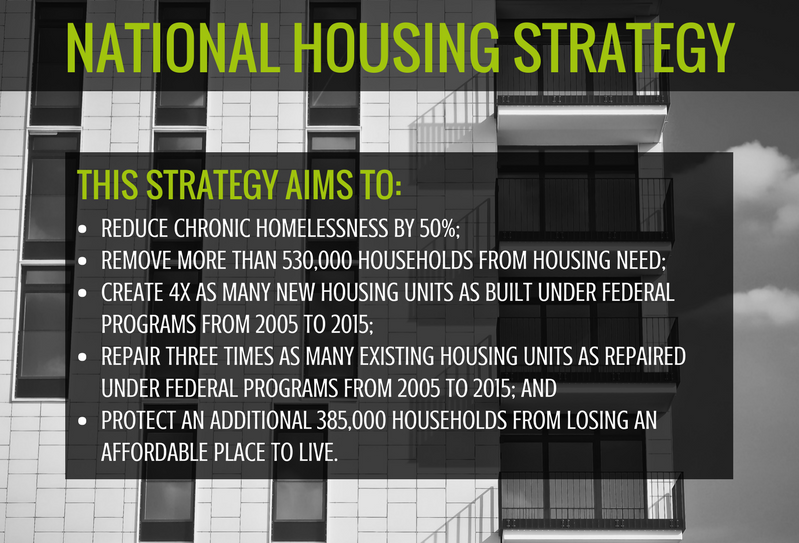 This strategy is making housing a priority and the $40 Billion investment, spread over a 10-year period, will be funded jointly by the federal, provincial and territorial governments. It addresses a large range of challenges and covers the entire housing continuum. With this joint investment, there are targets that this strategy hopes to attain which include 100,000 new housing units created, 300,000 existing units repaired and renewed, 300,000 households supported through the Canada Housing Benefit amongst others seen below. For all of your real estate needs, contact Amalia Liapis at 604-618-7000 or alternatively, at amalia@wesellvancouver.ca. The British Columbia government is reviewing the foreign buyers’ tax in the Vancouver area and the interest-free loan program to first-time homebuyers to determine whether they have helped improve affordability, BC's new housing minister says. A year ago, the Liberal government implemented a 15% tax on foreign nationals purchasing property in Metro Vancouver in an effort to cool skyrocketing house prices. This tax isn’t applied to commercial properties, only residential properties. Selina Robinson and BC Finance Minister, Carole James, will review real estate transaction data to determine whether the 15% foreign tax should be kept, revised or scrapped altogether. The data will be analyzed in order to determine whether it has been beneficial in housing affordability. According to data from the B.C. Ministry of Finance, during the period of June 10 - August 1, 2016, 13.2% of all property transfer transactions in Metro Vancouver were involving foreign buyers. Once the foreign tax took effect, that figure fell to 2.6% during the period of August 2 - December 31, 2016. Figures recently released revealed that the government took in $102 million in revenue from the implementation of the foreign buyers' tax between August 2, 2016 to March 31, 2017. In the months after the tax, there were signs of cooling in Vancouver’s housing market, with the number of transactions falling. However, there have been signs that the market may be rebounding, as prices continue to creep up. The Multiple Listing Service composite benchmark price for all properties in Metro Vancouver was $998,700 in June, an increase of 7.9% from the same month last year. Join us as we dive into the residential sales statistics for the month of May. There has been a record number of sales of 13,458 residential units which is a 32.3% increase from May 2015 and a 3.77% increase from April 2016. The total sales dollar volume shot up by 51.1% compared to the same period last year to $9.72 Billion. In relation to the average MLS® residential price in BC, it increased 14.2% year-over-year to $722,146. "Record housing demand and dwindling inventories are continuing to push home prices higher in most BC regions," said Cameron Muir, BCREA Chief Economist. "Total active residential listings across the province are nearly 30 per cent lower than twelve months ago." "New home construction activity is at a near record pace in the province," added Muir. "Once the current crop of homes are ready for occupancy there will likely be more selection for home buyers and less upward pressure on home prices." As a result of the ongoing trend of demand outpacing supply, there are a record number of homes under construction in the Metro Vancouver market. The BC residential sales dollar volume on a year-to-date basis has jumped to $41 Billion which is an increase of 62% in relation to the same period in 2015. The residential unit sales increased by 35.2% to 54,455 units and the average MLS® residential price increased by 19% to $752,105. 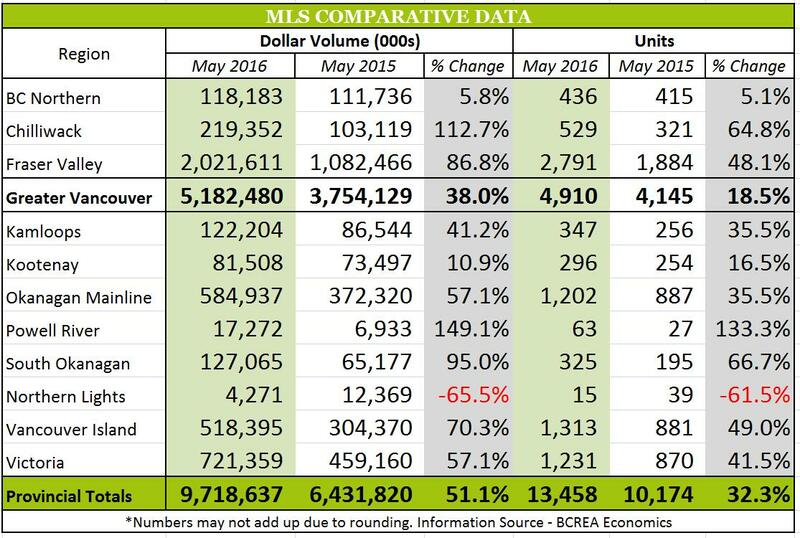 Take a look below for a regional breakdown of MLS comparative data and the changes from May 2015 to May 2016. 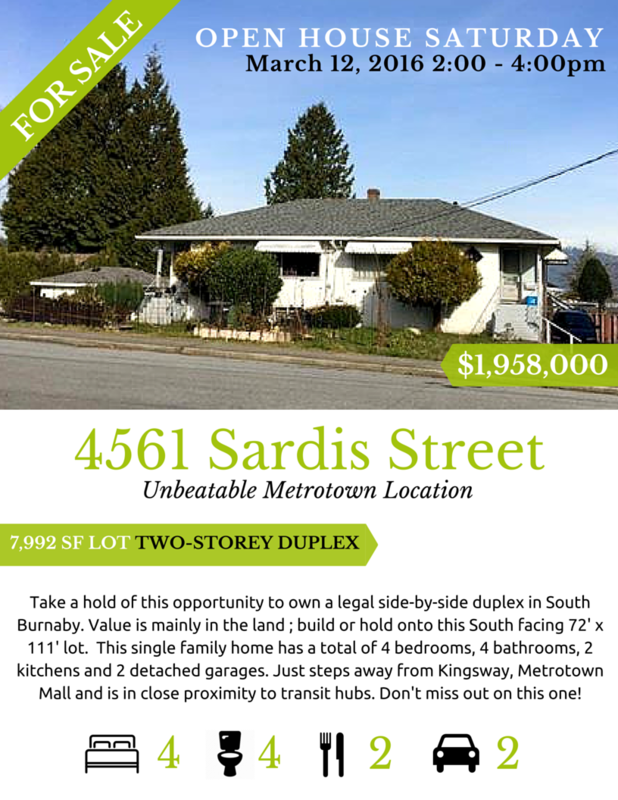 Come join us TOMORROW for an open house at 4561 Sardis Street - we can't wait to meet with you. For additional information on this property, contact us at info@wesellvancouver.ca or alternatively at 604-716-6155. Just as predicted, the housing market in BC is off to a strong start with 5,831 recorded residential unit sales on MLS which is a 33.2% increase in relation to January 2015. Correlating to those sales was a total sales dollar volume of $4.39 Billion which is a 69.1% increase compared to January 2015. Looking at BC's average MLS residential price, there has been an increase of 26.9% year-over-year. Below you will find two charts with comparative data between January 2016 and January 2015 and their respective percentage changes. 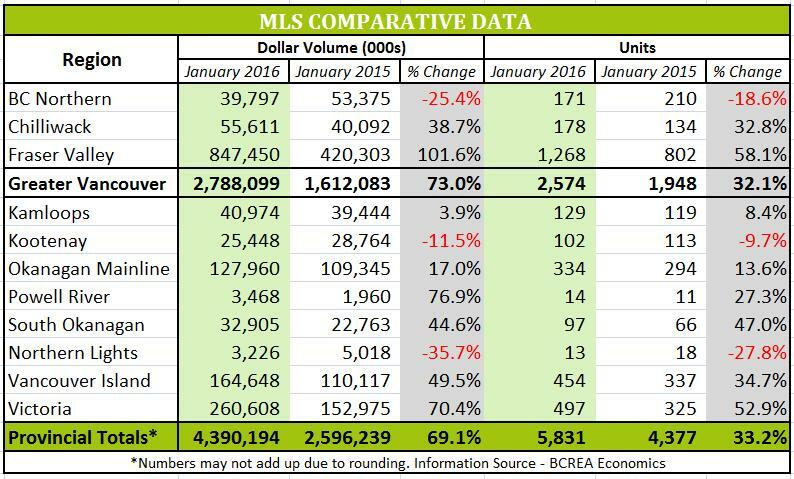 Despite the strong housing demand, MLS residential sales are forecasted to see a slight 6.2% decline for 2016. Additional information for this year's projections can be found on our last blog here. 2015 Housing Stats are In! According to the British Columbia Real Estate Association (BCREA), residential sales for December 2015 totalled 6,590 unit sales which is a 29.8% increase in comparison to December 2014 figures. As for the total sales dollar volume, it increased by a staggering 55.4%, ending the year off with an additional $4.62 billion in sales! Average MLS residential prices in BC hit a new record by going over the $700,000 threshold for the first time with prices averaging out at $700,943. 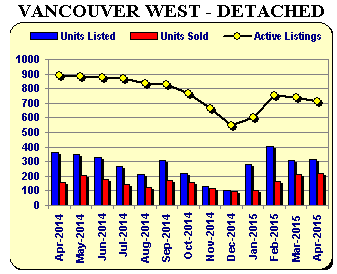 Take a look below at the BC Residential Unit Sales. As you can see, there has been rapid growth over the past few years with 2015 almost exceeding the record number of sales in 2005. At this rate, it looks like 2016 will be a promising year. "The 2015 housing market finished in dramatic fashion, with record demand for the month of December," said Cameron Muir, BCREA Chief Economist. "BC home sales breeched the 100,000 unit threshold in 2015, and it was only the third time on record that this high watermark was achieved." The higher than normal average MLS residential prices in conjunction with the record annual unit sales allowed for $65.3 billion in sales for 2015, which is a 37% jump from 2014 figures. Last year was definitely a strong year in favour of the seller and this year looks no different. 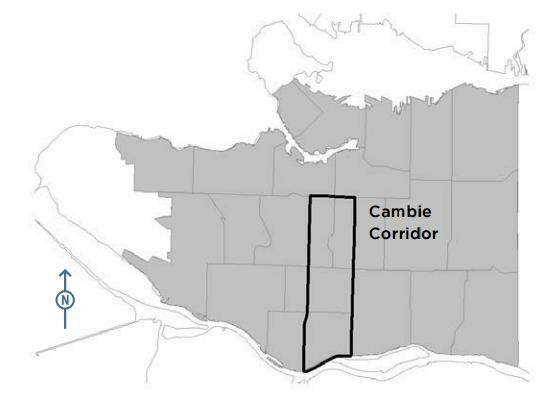 Looking for major developmental projects happening in the Lower Mainland? Look no further! 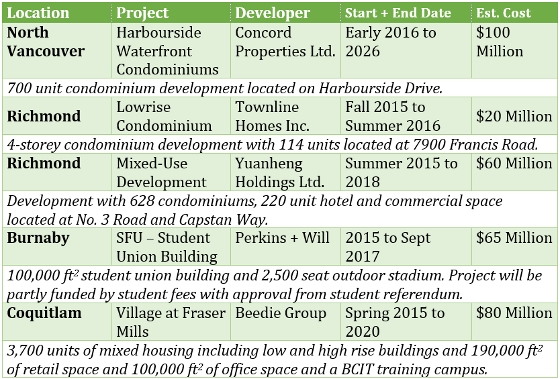 The BC Major Projects Inventory (MPI) gives details on projects within BC with a capital cost value of $15M or $20M within the Lower Mainland area. Take a look below for a snapshot of some private and public sector construction projects. For a more comprehensive look at the projects, click here. For all your real estate needs, contact us at info@wesellvancouver.ca or alternatively at 604-801-6654. 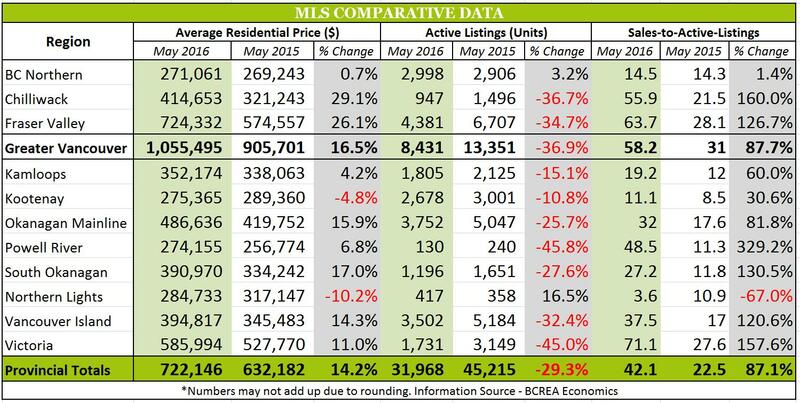 Cameron Muir, Chief Economist of the BC Real Estate Association (BCREA), gives a quick, yet detailed overview of the May 2015 statistics. Looking at the statistics, seller market conditions are prevailing. 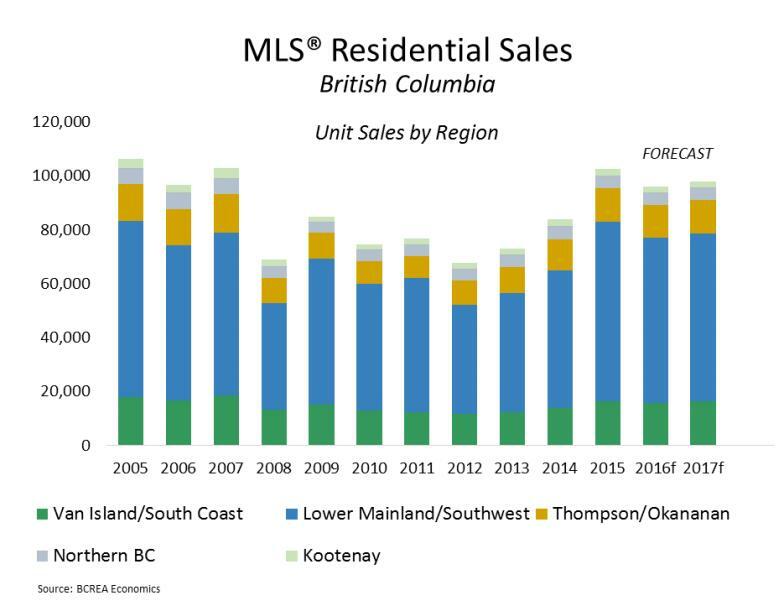 In the first time since 2007, MLS residential sales within BC surpassed 10,000 units in the month of May with an astonishing 10,174 residential unit sales recorded. Looking back at the first five months of the year, there has been a 22% increase in home sales and a 35% increase in the dollar volume bringing it to $25.4 billion. In contrast, there has been a 14% decrease in inventory of homes for sale from the previous year at approximately 45,000 units. This is the lowest level for the month of May since 2007. "Home sales for the month were at an eight year high for the month of May," said Cameron Muir, BCREA Chief Economist. "Strong consumer demand is pushing home sales up in most of the large urban areas of the province." Average home prices for BC have seen an increase of 12% year over year at $632,000 and the price for a typical home increased over 9% in Vancouver. Moving over to the commercial side of real estate, retail sales have grown more than 8% through the first quarter of 2015. This growth rate has been the highest in the past five years.